Larger commercial installation are relativly cheaper and also more efficient. 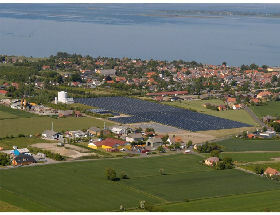 The world's largest solar thermal plant was installed 1997 at Marstal, Aeroe, Denmark. The effective size of solar absorption panels covers today 18.365 m2 and the annual yield is 8.400 MWh. 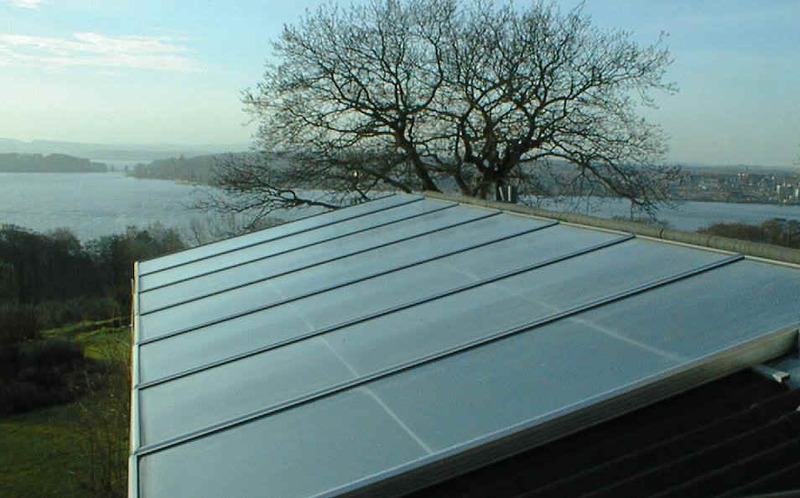 The most efficient panels with vacuum tube solar collectors yield 550 kWh/m2/year. Investment costs in 1997: ~ 2,500 DKK per m2 or ~5.50 DKK/kWh annual output (One USD ~ six DKK). The annual yield of the 18.365 m2 solar thermal collectors in Marstal is equivalent to the yield of two 2 MW wind turbines or 75.000 m2 photovoltaic panels. The draw back is the high output during summer with no use for the excessive energy in domestic installations. The average capacity of six different solar plants in Denmark with a total of 12,708 m2 solar thermal collectors is calculated and illustrated below. All these solar plants absorb solar radiation in circulating water and glycol used for preheating circulating water in central heating plants. Our own installation at Skanderborg, Denmark at 56o2,27'N 9o57,14'E covers 21 m2. The suntrips (solar thermal collectors) are made of copper tube with aluflaps. Aluminium plate on both side of the tube is brought in intimate contact with ultrahigh pressure. The sun strips are painted dull black. Six strips is placed alongside each other in an outer aluminium frame insulated with rockwool at bottom and sides and covered with a channelled double layer poly acrylic window. The sunstrips are interconnected. Glycol + water is used for transport of absorbed energy to heat exchanger transferring to central heating system. Circulating pump is triggered by a temperature difference.